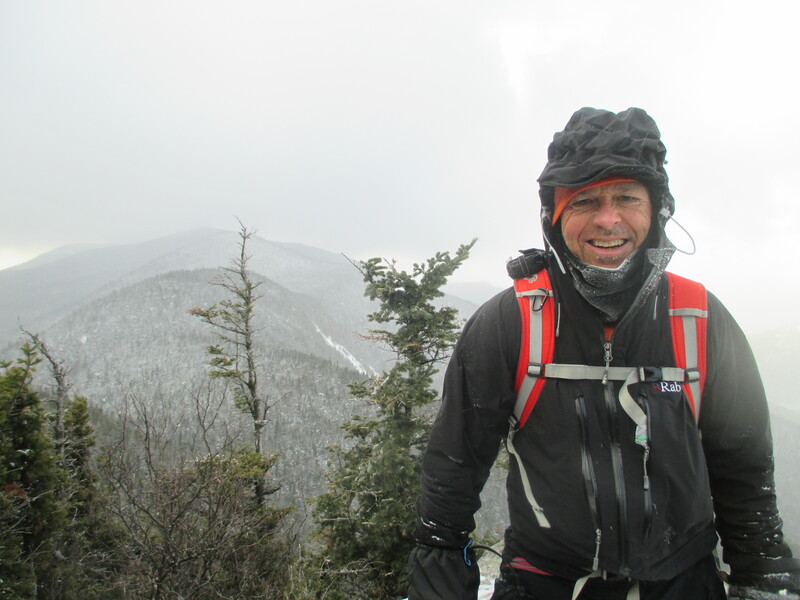 Project 46 – A one-man fund raising event reaches for each of the Adirondack 46 high peaks. In August, 2016 I will begin Project Full Deck, a linear hike that will traverse 52 summits in the Adirondack Mountains of New York State. You can follow the preparations, and the hike itself come August, on the blog I set up specifically for Project Full Deck. The Adirondack Daily Enterprise published a well-researched and lengthy article on Project 46 in Saturday’s edition. Author NeilPosted on March 16, 2014 March 16, 2014 Leave a comment on Adirondack Daily Enterprise article. Nowadays, most of us can expect to live 20-30 years beyond retirement. Many of us, unretired, have more free time on our hands than people ever did before. Most of us have greater health, more free time and a better standard of living than any members of the human race who have ever lived. Why squander such a priceless gift in front of the TV destroying your health with Cheeto’s, beer and aimless boredom (which by the way, is very harmful to your health and reduces your life expectancy)? Projects can be a lot of FUN to conceive, plan, organize and above all, execute and live. For anyone who considers “fun” to be something frivolous then how about personal growth and development, learning new skills, acquiring knowledge and while we’re at it: self-esteem and self-discovery? No need to lead a boring life, just let your mind wander at will and dream a bit. Then, get off your keester and get cracking! This little post might help you turn your dream into something real, something to be lived and cherished. A few considerations to ponder. A project can be anything and any size, it can last a lifetime or an afternoon. It can cost a fortune or it can either be free or make you (or someone else) some money. It can take place on the other side of the world or in your own back yard or town. It can involve the outdoors and require great physical fortitude or it can involve visiting old libraries and reading old dusty books. I think it’s important that your project be a good fit. If you’ve never sailed then crossing the Atlantic, solo on an 18 foot sailboat, while realizable given enough time and money, probably isn’t a great fit. But perhaps you’ve worked with disadvantaged children all your life and love to travel. Taking a sabbatical leave, or at retirement, joining a charitable organization and traveling to another country to run or assist with a development program might be just the right thing for you. On the other hand, you might consider that something smaller like getting into shape and losing 20 pounds is the most inspiring idea you’ve ever heard of for a project. Other ideas of various sizes: learning a new language, learning to play a musical instrument and giving a concert, climbing a mountain, running a 10 k race in 50 minutes, going on a canoe trip (big or small), taking cooking classes in Italy. Projects can be just about anything. That’s the beauty of it. It’s all about YOU and you only have to be turned on by it. It doesn’t have to be beneficial to society or anyone else, it can be public or very private. You are the creator and executive decision maker! My wife usually starts with a huge blank sheet of paper and draws bouquets of curly-edged circles that look like fair weather clouds with lines joining them together. In the middle is the project title. Everything she can think of gradually fills the page. Over a period of time she can fill several pages. A few guidelines to get you going. So, who are you? Try and be honest here and write down your your aptitudes and weaknesses, likes and dislikes, skills or lack thereof etc. etc. No sense in climbing Kilimanjaro if you hate exercise. Where are you? Look around, perhaps there’s a project staring you in the face and you didn’t even know it, something close to home or an easy drive away. What are your strengths? Perhaps you have great powers of concentration or inexhaustible physical endurance or you pick up languages quickly and effortlessly. Whatever your strengths, you might want to capitalize on them. What are your weaknesses? Don’t have any? Fine. But if you have a health issue, or get seasick then you’ll want to tailor your project accordingly. What are your assets? You might already have a few things or some background already at hand, acquired in an unrelated way. This could be a social network, special skills, travel experience or some of the gear you might require. It might be money in the bank. What’s missing? You might want to draw up a list of things and skills, if any, you will need to acquire during the preparation phase. You can work your list as you go along. Have an end point. This isn’t essential if your project is a lifetime one. However, it’s more easily managed and executed if you can begin with the end in mind. Nesting projects. You can nest one project within another. Prior to backpacking through the Italian Alps you might want to learn to speak Italian or lose 20 pounds, or both! Set a time frame. When do you hope to start and finish your project? 10 years from now might seem to be too far away and tomorrow doesn’t leave much time to get ready. Perhaps somewhere between 3 months and 2 years will work for you depending upon the magnitude and expense of your project. Make it challenging and exciting. By challenging I don’t mean so difficult you have less than a 1% of succeeding. Remember, this is supposed to be something fun and positive. But, IMHO it should be something that makes you dig down and show some grit, get out of your comfort zone and explore some unknown personal territory. It doesn’t always have to fun to be fun. You should feel excited by your project, maybe even intimidated. In my case cleaning out the garage isn’t a challenge and doesn’t turn my crank so for me that’s a chore that needs doing but hardly a project. Plan on succeeding. Don’t sabotage your own project. Challenging yes, but don’t make it so hard you are likely to fail. Instead of setting your sights on a solo climb of Mt. Everest perhaps you should look for more modest, yet challenging mountains you feel pretty sure you can climb. Do it with someone else. The obvious choice here is your spouse or partner. I know a couple who just retired. They are hiking across together across some island of Japan that has a number of temples on it. He has everything on his iPad. How will your project affect your family? This can be delicate and you probably should talk about it with your spouse. If your project is to run a sub 3-hour marathon you might want to look into how your new all-absorbing lifestyle is going to impact your home life or you might not have one left when you’re finished. Start today. Jump in, the water’s fine. It doesn’t matter where you start. Pick a piece of the puzzle and start solving it, right now! Speaking for myself, I have two very big projects on the distant horizon but am not yet at the concrete planning phase, I’m still dreaming and letting vague ideas take shape when I’m out walking around. These important projects will build upon my strengths and draw upon the skills and experience I have already acquired. They turn my crank, intimidate me and are extremely challenging, mentally and physically. I will have to develop new skills, get new gear (yippy!) and I will definitely be sitting down with my spouse to discuss the impacts they will have on her life. Regarding doing a project as a couple my spouse and I have areas of common interest and share certain values. We can each bring different personal assets to the table. As we approach retirement we would like to get involved with bigger “team projects”, which will be of benefit to the world in some small way. We think globally but try and act locally. And there you have it. Project 101. What are you waiting for? When I got home I had pictures on 3 SD cards, two different computers and on a Google Drive. In addition to my pictures I have excellent ones from Geoff and David. It took me some time to get them all organized and separated into individual folders for days one through ten. Now to mercilessly whittle them down to the best of the best and post them! I said I would sit down and write this entire project up, end to end and so here I am. I’ll tell you right from the get-go that this is a success story pretty much all the way through. With no false modesty, and in looking back, I pat myself on the back and say to myself, “looks like you did something right old bean”. I wanted to reach people and in that regard left no stone unturned. I also wove the theme of our family tragedy into it because in the first place, everyone knows about it but also because there are people out there who are living their own tragedies and trials. Perhaps the project would give them a little boost at a time when they need it most. As I’ve already mentioned, Cory Delavallé was my inspiration. His record breaking winter 46 last year was huge in that he was alone for the most part, had very little support and encountered some very difficult trail conditions but he succeeded in establishing a new winter record. No one ever met him at the trailhead with a warm car, he was usually out there alone, often in the dark, breaking trail on some days in deep, gloppy snow. Just knowing Cory had done it was the first big pivot of several. 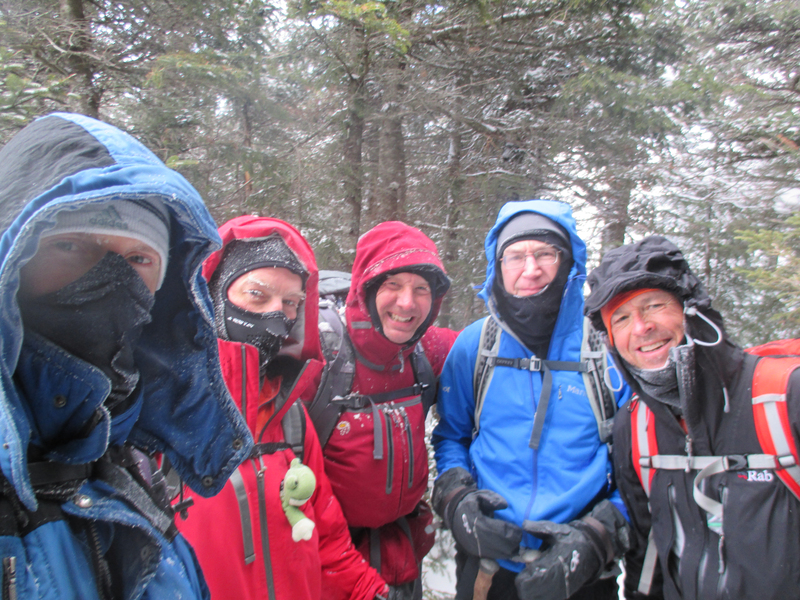 Then I wrote in private to a few hardened hiking friends that I was considering doing the 46 in 10 winter days and Joe Bogardus made a reference to superman in his comments. That gave me a big pause for at least a week. But, I kept looking at Cory’s sequence of days and slowly I felt I could do it in ten. Then Tom Haskins offered me the use of his vacation rental in Keene, NY. This was another big pivot point and I knew by accepting that generous offer that I was committing myself. Major gulp moment! Somewhere along the way I got the idea of making it a fund raiser for the Foundation. I have always felt that the Foundation was not reaching its fund raising potential and envisioned Project 46 as helping to change that. The Foundation doesn’t bear Dominic’s name but it embodies his memory for me because his death and the forum’s reaction thereto spurred its creation. Also, even after all these years the sadness and grief still pulled at me like a ball and chain and have prevented me from being as available as I could be to my family. In the mysterious ways of the mind I can see now that I was looking for a final catharsis. Back in August, after our vacation, I began to get ready. I already had a solid base level of endurance and mental toughness but knew I had to break through into brand new territory. I had plenty of time and wanted a gently sloping up-ramp so as to avoid over-training, burnout or injury. I quickly discovered that there was next to no information available that was related to my endeavor. How do you train for 10 consecutive 7,000 foot days? What do you eat? How do you avoid hitting the wall? I read books on marathon and ultra marathon training and extrapolated. By August I had already lost some weight but now it became more serious. I created a 500 calorie per day deficit and by sticking with it like glue lost a pound a week until roughly 30 pounds total were shed and my body fat went from 25% down to 15. I greatly improved my diet in general and had fun delving deeply into the weight loss and nutritional literature, reading 15 books along the way and learning a lot about the prevailing nutritional theories. The concept of “performance based nutrition” is the one that resonated best with me and guided me throughout. I upped my hiking, gradually at first, but more and more as February drew near. Some memorable hikes include a 21-hour bushwhack in the Sawtooth Range, doing all 5 summits on the ADK-100 list in a day and two identical day-hikes of 10,000 foot elevation within 3 weeks of each other. On the 2nd one I decreased my time by 1 hour 17 minutes having Glen, “Mastergrasshopper” Bladholme as my coach and rabbit. In Montreal, one mile from my office I was able to climb and re-climb a 300 foot steep and rugged gully 7 times, 3 days a week for a total of 6000 feet per week. I always carried a ten pound dumbbell in my pack. I did this series of climbs on the days immediately before and after all of my training hikes in the Adirondacks and I did them hard and fast for intense workouts. I joined a gym and did Turkish getups, single leg reaching dead lifts, step-ups, sit-ups and Bulgarian single-leg squats always increasing the weights slowly but steadily. 3 series of 8 reps per exercise with enough weight to make it good and hard. By November, I was extremely focused and in early December went public. I published my Blog and announced Project 46 on the forums (in English and French) and on Facebook as well as to my and Sylvie’s email address book. 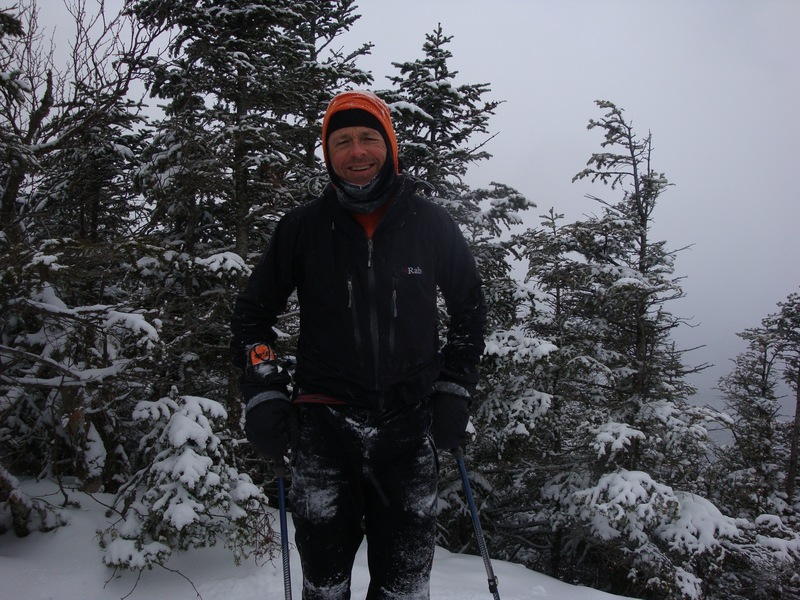 I also gave an interview to the Adirondack Explorer. Jack Coleman set up the donation page and my neck was sticking out pretty far. Pressure and fear of failing. Not much to say about that. What resonated with me was a seminar I had attended years ago. The speaker was talking about powerful people versus the power-less. Powerful people experience and live with a lot more fear because they lean out a lot more. What makes them different is that they don’t let the fear bother them or get in the way of pursuing their goals. I liked that but the fear of failing, now that this was so widely publicized, both niggled at me and motivated me. I thought of the Project all the time. I had a lot of fun. I didn’t keep track but from August to Day One have probably done 100 peaks, probably more. Besides the training I wanted to gain a mental imprint of the routes and their requirements and difficulties. Towards the very end I did more or less whatever I wanted and ended up gravitating around Haystack and Marcy, two of the highest and most exposed summits of the entire 46. I did the peaks in every conceivable manner, in conjunction with other peaks and created some oddball routes, combos, through-hikes and circumnavigations. Conditions were tough: cold, windy and icy. I did more than a few hikes alone in remote territory without seeing a soul all day. Mental hardening. A few lessor pivots that gave me much needed confidence were three 4-consecutive day training hikes. The first was at the end of November, then I did another at the end of December and the final one I did at the end of January. On each of the day fours I was still feeling fresh and going fast and strong. I tried a few things. Key was my “witches brew” protein drink. I don’t know if was the ultimate best but my recipe included 2% milk, whey protein (lots of branched chain amino acids), organic spinach, frozen fruit and plenty of sucrose (table sugar). I would have 500 mls (2 cups)for breakfast and 2 cups on the trail. Additionally, I would eat one protein bar and a Cliff bar cut into bite-sized pieces, a mixture of raw chopped up nuts with dark chocolate chips and dried cranberries along with good quality chocolate bars. My food was pre-cut into pieces and in zip-lock bags, readily available in my jacket pockets. Towards the end and on P-46 I added dates, figs and dried apricots and really good chocolate cookies, especially Doreen’s!. Bt day 3 I was all Cliff barred out and switched to pastrami sandwiches: real food. A marathon entails a calorie burn of between 2,000 and 3,000 calories. According to my calculations, and using on-line tables and my seemingly very accurate heart rate monitor I would be burning around 8,000 calories per day, for 10 days! Throughout my prep and weight-loss period I considered carbohydrates as a form of fuel, like gas in a car. My carb intake was therefore closely correlated to my exercise volume, not according to some diet guru’s dietary advice. I read up on using plain old sucrose (ie. white table sugar) as a fuel source because it’s so cheap and easy. A 5-pound bag goes a long way and costs a pittance. Compare the per gram price to something like Gu or shot blocks or glucose polymer. One literature review that I carefully read twice reviewed many studies and suggested that using sucrose for pre, during and post endurance exercise in particular was more than adequate for my needs. The better shape you are in and the better you pace yourself the more you burn fat instead of sugar for fuel. Roughly a 50-50 ratio in fact. It turns out most of us have enough fat to fuel a few marathons. Enough about preparation, on to the actual Hike! Day 0: I worked a full day and had the car all packed near the office. I was in bed at Tmax and Topo’s by 10 but couldn’t get to sleep. Boghollow was coming by at 6 to get me for the Sewards. I lay awake from 3 to 4 and finally got up, made coffee and got ready. Day 1: I opened the trail register (in the Adirondacks there are registers and you are requested to sign in and out on trailed hikes) and saw, “Allez Neil” written there. A nice little lift from Albee. The hike was straightforward over well-packed trails that were slightly blown in. It was very windy and the dampish air was cold. We had to keep a move on to stay warm. At every opportunity over the 10 days I would be dropping my pack and after the first peak, Donaldson, we had about 2 easy miles round trip to Mt. Emmons and it was indeed a pleasure to hike pack-free and get dry. My jacket, a Rab eVent is very breathable but with a pack my back always gets wet. I wear just a light base layer shirt under my hard shell no matter how cold it is. I adjust my hand wear and my head wear a lot while hiking and use various pant and long underwear combinations according to the weather and conditions anticipated. Things like temperature, wind speed, exposure of summits and whether the trail is tight or broad and if the fir trees will be covered in snow all influence my choice of leg wear. Anyway, all went well and on top of Seward the trail changed drastically. Instead of armies of hikers going out to Mount Seward and back again thus creating a hard “sidewalk” now we had only Cory and Albees’ track over a much less frequently traveled path. The drop off of the north side of Seward is about 2000 feet and the path is unmarked and difficult to follow. They had gone the day before to help me and had broken it out. I had done it 2 months previously with Trail Boss and had recorded a GPS tracklog but I knew it was going to be a bear of a job on a very long day. But now, it looked like a paved 4-lane highway! We were down it in no time although we had to take care with every step or we lost balance and plunged, stripped of all dignity, head first into the deep snow. Down below, at the Ward Brook lean-to we stopped, ate and drank and dropped our packs. I had a 20 liter Sea to Summit syl-nylon summit pack into which I put a warm jacket and a head lamp. Seymour goes straight up 2000 steep feet and is ab-so-lute-ly unrelenting. However, I knew every twist and turn and was able to tell Boghollow exactly what was coming. If you keep expecting the grueling climb to relent and it doesn’t you can get mentally discouraged and this plays itself out in your physical reserves and stamina. More on that later – it’s a fascinating topic in it’s own right. We moved well and the trip down went very quickly. 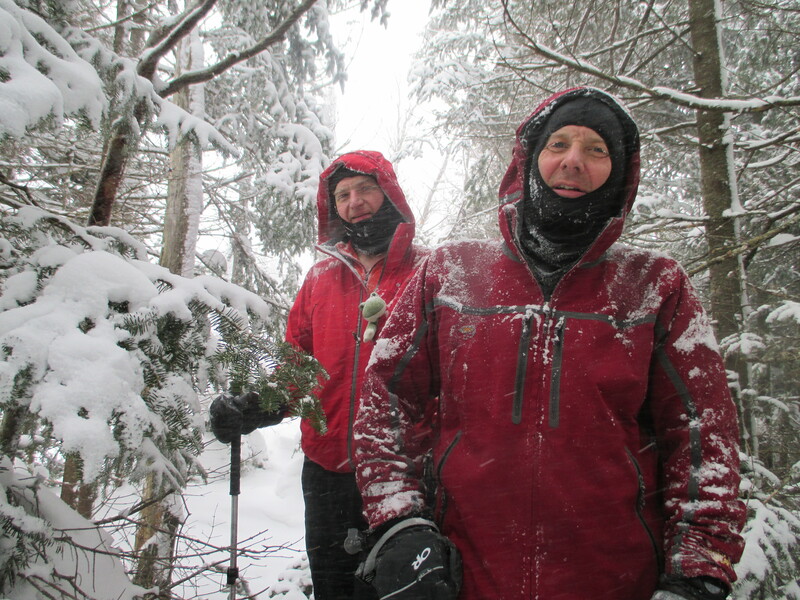 The snow was perfect for snowshoe-skiing, telemark style. I forget our exact time to get down off of Seymour but it was very fast. Back at the lean-to we ate and drank some more, put on our headlamps and then we began what I call trudgery for 8 miles. Back at the truck at 9, after 14 hours of nearly non-stop snowshoeing Tom (a lot of us forum members have two names) asked me if I was ready for 9 more days like that one. Then he reached into a cooler and brought out chocolate milk and home-made oatmeal cookies. I was on them like a dog on a bone. Back at randomscoots at 10 I was feeling beat and wondering how the heck I was going to do this thing but when I walked in the door it was like a party. Doreen handed me plates of food and the second I was done whisked the plate away and replaced it with another. Tom filled me in on all the goings on on the forum and the opinions and strategies being put forth within my private Project 46 forum. Soon, I felt really, really good and we planned the next day and tossed ideas around for days 3 and beyond. Always, it was, “what does Cory have to say about that”? Day 2: at 6am Joe Bogardus (Joe Cedar) and David Gomlak (no C, Topofgothics) picked me up and we drove one hour to the Santanoni trailhead on Upper Works Road. I always got up at 4:30 to be out the door at 6, which gave me very necessary quiet-time every morning. I played Bach keyboard music on the CD player, which was the perfect choice for me. (played on modern piano by Angela Hewitt.) The three Santas was an easy day after the Sewards. The descent off of Santanoni on the Santanoni direct trail was huge fun in very deep unconsolidated snow with just enough of a base under it to give us stability. Up high it was a challenge finding and staying on it, even with Joe running the GPS and me playing the role of a human probe. We flew out and it was great to be back home before dark. Every time I walked in the door I was greeted with a big hug from Doreen and Tom took care of my pack while I ate and checked the computer: there was always the weather forecast, ADK High Peaks forum, Project 46 forum, Fousderando forum, and my email to check while Tom gave me condensed versions of it all. Then I went to bed. Glen (Mastergrasshopper) and Geoff (Kyler) came in that evening, settled in and then it was…. Day 3 the mental strain day: We began at the Loj and went over the Lake Arnold height of land and ascended Feldspar Brook for our first mountain: Gray Peak. Gray, Skylight and Marcy went well. On Grey we were light-hearted and care-free in the sunshine with that wonderful view of Marcy and Skylight. We broke out all three but Marcy seems to have been the toughest. Maybe because Geoff broke out Skylight the whole way! Glen and I split the job on Marcy for 500 vertical feet to tree-line whereupon it was blown down to bare rock and hard crusty snow and ice. From Marcy we quickly reached the junction of the Van Hoevengerg and Phelps trails. We followed the unbroken Phelps trail easily downhill for 600 feet (all feet values means vertical ascent or descent) and from there it was uphill those same feet to the summit. I was feeling mental strain as the hours wore on because of Basin and Saddleback not being broken out and because of the wall of Saddleback. In spite of being mentally prepared to climb it in the dark I greatly preferred to do it in daylight. Basin would be a steep climb in deep snow and the descent in deep snow towards the Basin-Saddleback col could be a big route finding problem and time-sink. I had been over the exact route only one week previously with Trail Boss and from the Haystack junction towards Basin there was no trace of our trail in the bottomless snow. I was very glad to have switched directions for this hike at the last minute. After we passed the nadir and we began climbing our pace slowed to nearly a standstill while our energy expenditure per meter of horizontal progress skyrocketed. We kept checking the time and trying to estimate the unknown. In order to spread the load amongst us we used the altimeter and switched leads every 250 feet. Going first was very draining and going last felt like you were just standing around. We got to the summit in less than an hour because after the Shorey’s Shortcut junction the trail underneath the powder was more solid. Nevertheless, it was a case of “when the going gets tough the tough better get going”. No pause on the summit, Geoff caught me summiting on his camera and I never broke stride. Having the route freshly imprinted in my mind was pivotal in getting us down quickly and just as I suspected the Basin-Saddleback col was wind-packed and we made good progress across it. Then we hit the very steep unconsolidated snow that leads up to the wall. We went into plod mode and after Geoff had done a share I went first. What to my surprise did I see but fresh tracks! Someone had descended Saddleback’s wall and most importantly for us they had descended the very steep trail section below the wall and then turned around and went back up. They had taken care to create steps as opposed to a ramp and all we had to do was walk up it like a staircase. This was huge! We realized that we would know from their descent route whether they had descended the summer cliff route or whether they had had to use the chimney route. The chimney route avoids the cliff at the price of having to get over a difficult step (some gear required for those of us like me who are challenged) up onto an icy exit ramp. The wall looked clean and dry (as opposed to being greasy with crusty snow or ice encased) and the mystery hikers had indeed descended it, which indicated that the upper reaches, which we could not see, would also be clean and dry – or so we surmised. We removed our snowshoes and attached them to our packs (I also stowed my hiking poles and donned my boiled wool mitts without shell covers) and within 10 minutes we were on top of our 6th and final summit of the day. Relief and joyous celebration ensued and then we began the 3 hour exit hike, descending from 4500 to 1500 feet in the process. 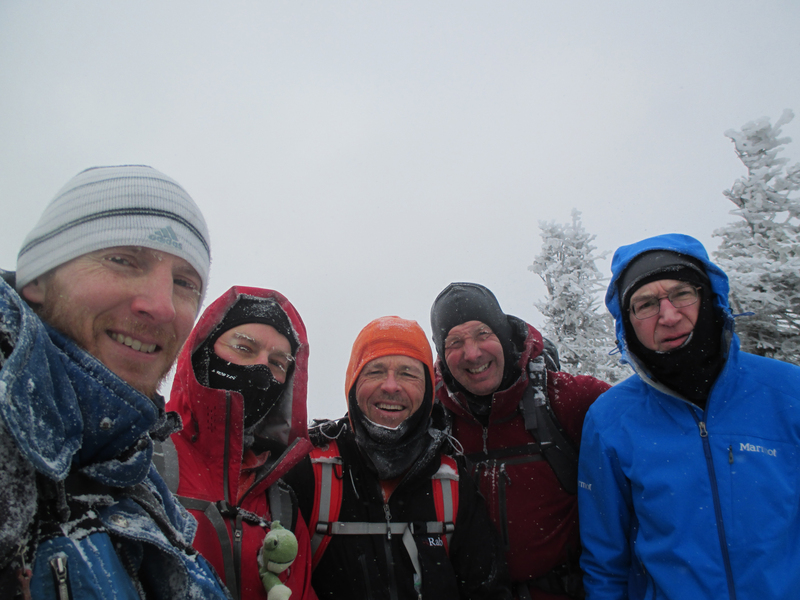 Back at ‘scoots: Day 4 was going to be a bad weather day and the forecast hadn’t changed. A lot of discussion later I liked Tom (randomscooter’s) idea of combining the biggest two-fers in the same “rest” day. There are 4 two-fers in the 46: two peaks that nearly always get climbed as a pair for an easy to medium hike. Giant-Rocky Peak Ridge and Whiteface-Esther combine to give something in the neighborhood of 8300 feet of climb. We would do the former, come back to ‘scoots, eat, get dry and re-load for Whiteface-Esther. Day 4: Giant-Rocky went off without a hitch. After lunch the first 2000 feet of Whiteface-Esther was miserable in pouring rain and temps near freezing. Driving to the trail head Glen had wryly remarked, “you know its bad when you have to turn the wipers on high as you approach the trail head”. At the Esther junction we were chilled and soaked to the bone. We paused briefly, decided we better switch plans and do Whiteface first so as to be off of it before dark and then I took off as fast as I could go along the long flat section and kept hammering when I got to the 500 feet up to the Willmington turn on the Whiteface toll road. I had decided not to stop and adjust my clothing because I had hiked myself warm, if still wet. The others stopped, changed and dropped packs. I kept mine. I pushed hard to the summit, we took pictures and then we got out of Dodge. The wind was blowing and sweeping across the summit ridge, visibity was poor and darkness was falling. It was through this section of hiking that I started to feel confident about my chances of doing the entire 10 days. I felt like a powerhouse in spite of it being a tough day 4 of 4 big hiking days. After a peaceful Esther – the weather had changed to clear and calm for a gorgeous sunset and some nice pics-we headed back to Project 46 HQ for more of Doreen’s down-home-on-the-farm cooking and got busy planning and scheming for day 5. The final hiking plans (peaks and their order) were usually decided upon at the last minute. It was Friday and Sylvie (coffee) was there to greet me. The cabin was a mess of gear. Mine remained strewn across the living room floor for the entire 10 days. Every morning my protein drink and my hiking food had been prepared the day before by Doreen and all was lain out, just so, for me or in the fridge. It doesn’t get any better than that. Doreen was totally consistent and I think I wore her out. Tom came over every morning at 5 with his coffee and I made him sit in the same place each time. He kept me calm and cool. Day 5: I decided to do Big Slide up and down from Johns Brook as opposed to over the Brothers. This avoided potential ice and we could drop packs, still full of expendables, for 2000 feet. This day turned out to be pure pleasure all day long. I said early on there was no need to ever look at the time, just let it unroll. The climb to Lower Wolf Jaw of course was long but dropping packs in the notch is always a nice relief. The highlights were Gothics from Armstrong, Pyramid Peak from Gothics and the gorgeous, late afternoon sunshine and lighting effects upon Pyramid, Gothics and the Great Range as viewed from Sawteeth. We were out with headlamps and Tom was waiting for us to take us home for supper. Day 6: Fresh horses. Geoff and Glen had done 16 peaks and 24,000 feet with me in 3 days. Day 6 was going to be an easy day for me. Joe Cedar picked me up at 6 and we met Trail Boss at the Round Pond trailhead, spotted a car at the North Fork crossing and were soon underway for a wondrous day of 5-star views, broken out trails courtesy of team Ringa (Rik and Inge and friends), bluebird skies and my favorite section of ADK trail of all – from the summit of Dix to Carson. I can’t get enough of that wild land and did two Dix range hikes for training. We met Justine (Veggieslasagna) on Dix and I invited her to join us on the other 4 peaks in the range. She seemed to be tickled pink at that prospect and was a great addition to our crew. We met and chatted with forum member Ridgerunner on Dix and Kerry on Carson. Joe completed his 5th consecutive single season winter 46 on Grace Peak (East Dix). He started his run of SS46-W’s at age 60,which proves that playing the age card to excuse or explain away one’s inactivity is a bunch of nonsensical hooey. We did the range in 10 hours I think and I got to bed early. Good thing too because Day 7 was coming and I would need fresh legs and renewed energy. Day 7: 8900 feet and 27 miles! It was also very wind exposed going up Wright Peak, over Algonquin and twice across the Boundaries to and back from Iroquois. Face masks and goggles were imperative. But we crushed those three peaks and then we crushed Marshall after dropping 2000 feet to Lake Colden very, very quickly. We attained 120 feet per minute of descent upon our feet and 160 for the sitting-glissade sections. From Marshall it was a long, long hike back to the HPIC (pronounced H-Pic and meaning High Peaks Information Center) but we got to cross the lakes Colden and Avalanche which is always a very special experience in winter. Back at the HPIC we ate and drank horrible coffee and at 4:30 were on the trail to Street and Nye. First you descend 320 feet and then you begin the long, unrelenting and steep 2200 feet of ascent. We did Street first and finished on little Nyester, a sub-4k peak which makes the list based upon tradition, not geography. It was very cold and windy and back at ‘scoots I told Tom I really needed his help. I was in an altered state due to fatigue and felt messed up. Day 8 was well-planned by yours truly. I skied towards Allen Mountain with waxless skis that nevertheless required 4 applications of kicker wax for a 5-mile run each way. I also carried an ice ax and wore pants that I didn’t mind ruining. I was alone for this hike having arrived 30 minutes late and missing Inge who, thinking I was right behind her speeding along on skis, sped along on trail spikes. We met and chatted briefly just below the Allen slide. I had left my skis behind at the gravel pit and changed into hiking boots for the 2nd half of the distance. The final section goes straight up for a final 1000 feet and has one of the steepest trails of the 46. Before the final section, at Allen Brook, I dropped a lot of weight and ascended with a 5 pound pack including the ax. At the summit I disassembled my hiking poles and stowed them in the pack and used my ax as a break and rudder for 1000 feet of very quick descent over an icy trail. Without the ax I wouldn’t have dared do a sitting glissade down that elevator shaft but as it was I saved myself some serious time and knee cartilage. The ski was a time and energy saver also. I was back at the car after 8 hours and wasted no time driving to the Cascade-Porter trail-head, which took just over an hour. I ate and drank root beer in the car and got dry. I was just getting ready to go when Albee pulled in. He had followed my Spot and was thus able to time his arrival with mine. He had a nalgene of scalding hot tea, which was a great treat. 300 feet up I realized I had no headlamp but Albee said he had three. Had I been alone I would have had no choice but to turn around and get one. Cascade-Porter involves 2300 feet give or take and I didn’t even feel it at all, doing the 1800 foot ascent of Cascade in about an hour. We got on and off Cascade’s summit block without headlamps and then we turned one on in night-vision red en route to Porter. Back at ‘scoots I was starting to feel sweet success but I still had 45 miles and 13,5000 feet waiting for me. Also, it was going to be very cold for day 9. Day 9: It had a sweet ring to it. DAY NINE! 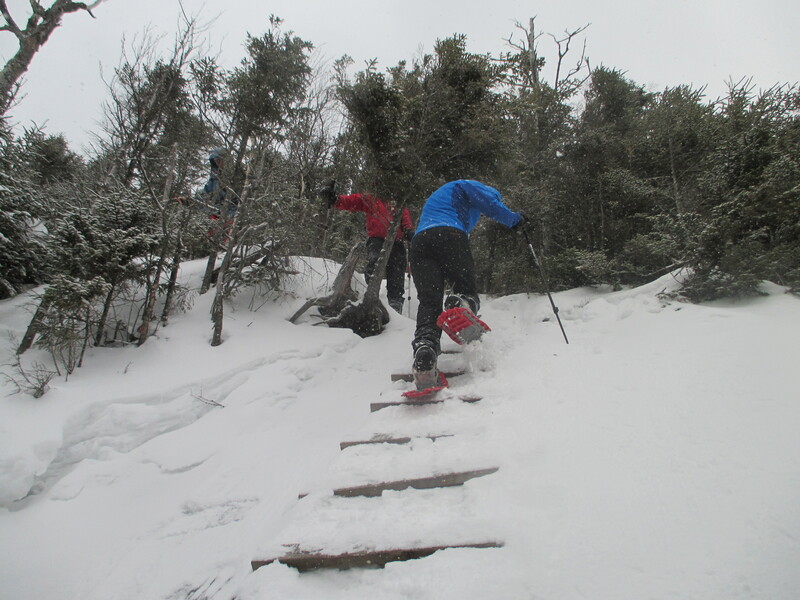 Joe and Albee were with me for the first part of this beast and David joined us as we were coming down off of Colden. He had been texting with Jack in Syracuse who gave him the Spot data as he flew along the trail trying to find out where we were. Modern-day hiking. The temperature hovered between 0F and -10F all day. We started with Redfield because I wanted to hit the furthest one first and then feel like I was coming home all day after that. Cliff was a piece of cake compared to last Christmas and Colden, Tabletop and Phelps which were all 1200 feet of climbing from their bases were readily sumitted. I put the pedal right to the metal for Tabletop, just because I could and got from the Van Ho junction to the summit, 800 feet up, in 26 minutes, flat. Phelps was done with greater sobriety and then it was a very speedy walk out and I returned alone Randomscoots to be spoiled by Doreen’s cooking yet again. I went to bed with visions of Day 10 floating in my head. I couldn’t believe it was at hand but it was. Day 10 was to be a medium sized day of 4 peaks, 19 miles and 6700 feet of elevation gain. On even the biggest hikes I was only drinking 2-8 ounces of water so for this one I only carried a half-full nalgene that I didn’t even crack open once. Dead weight all day in my pack. The order of peaks I changed several times in my head and finally considered Cory’s concern that Nippletop might be difficult with snow gradually filling in that steep climb’s trail all week long. We started with Dial and 3000 feet of climb to start the day. The 2-mile 1000-foot traverse to Nippletop took less than an hour but felt like three. Dave really wanted me to finish on Colvin for some reason and I didn’t really care so I by-passed the true summit by like 5 feet and we all headed to Blake for the out and back. Left the packs on Colvin. Albee and I pulled up the rear and David was on Colvin’s summit waiting to make a video of my arrival. He put an envelope in a tree containing a certificate he had made with Colvin as the finishing peak. I asked him what he would have done had I pulled a last minute switch in peak order and he broke me up by pulling out Blake and Dial certificates. Hilarious. For some reason though he had muted the mike and all you get on the vid is a silent movie. We were out nice and early after a 9 hour (I think) hike. As soon as I got to the Lake Road and began the 3-mile walk I started feeling pain in the front of my ankles. I’d been nursing this weird and first-ever pain in my extensor hallucis longus musculo-tendinous junctions for 7 days and I attributed it to the snow-shoe telemark skiing I’d done a lot of on day 1 and 2. I felt now that it was time for me to stop hiking. On the brain as the central governor. The central governor idea is an interesting concept that makes sense to me. Our bodies can be viewed as being made up of hardware, wetware and software. The bones, muscles heart, lungs and blood vessels etc. are hardware. The physiology going on in our cells and organs is the wetware and the nervous system is the software. The nervous system is actually a series of layered computers that are interconnected and which communicate with each other constantly. The most recent addition, which makes us human by the way, is the neo-cortex, which houses the central governor. You go downwards in evolutionary time to the limbic brain, the reptilian brain and on down to the autonomic nervous system and most primitive brain which is housed in the spinal cord. Your central governor can override everything and make or break a mission like P-46. Simply put, if you are upbeat, optimistic and driven to succeed you will download this “information” and it will make itself felt all the way down to the wetware, which is the earliest “ware”, and which began evolving 3.5 billion years ago. If you are only half-way into or hesitant and doubtful what you are doing your physiology won’t respond the same way. This probably applies to rate of tissue breakdown and repair as well and involves something called cytokines, which are signaling proteins that tell cells whether to build infrastructure (growth and repair) or tear it down (decay). Since I read Tim Noakes’ book, Waterlogged I have ceased using electrolytes and only drink to thirst, never ahead of thirst. That explains why I do these big hikes on a cup or less of water. I’m not thirsty (or I would drink more-duh!) and carry less weight. I trust my thirst mechanism, which has been evolving in humans for 7.5 million years and in mammals for a heckuva lot longer than that. Also, when you hike and liberate glucose from glycogen, water that gets stored with it is liberated. This gives you up to 2 full nalgenes of water on board that you utilize as you hike. Why carry much more? On being younger next year. Younger Next Year is a book my sister (Big Sister Laurie on this blog) referred me to a month before P-46. I can’t recommend this book highly enough to anybody, regardless of their age although it is specifically directed to anyone over 40. (there is a women’s version too). Quick summary: what you eat and how much and with what intensity you exercise can influence your body to grow or decay. Studies on aging at the cellular and whole-organism level prove it. Additionally, being socially connected and caring about something and/or someone are potent drivers of being “younger next year”. I believe I hit a grand slam home run with Project 46. Sadder note but positive direction. I often thought of Dominic on this wild trip and often had lumps in my throat and came close to tearing up. I would so much have loved to have done it with him. He would have been a monster and we would have had way too much fun. But I have two other boys and when they lost their brother they lost a lot of me. This trip has really helped me turn the page and even prior to Day 1 we were getting together a lot more. My eldest is an artist and he and his artist friends followed the Spot just like everyone else but they saw something a whole lot different in the Spot tracks. We just discussed a cool art project that I will be doing with both boys that will integrate my pictures and the Spot tracks and JP knows just the gallery where we can do a showing…..
Project 46 was the biggest thing I’ve ever taken on. It was a juggernaut. Once the dust settles and the time is right I know another big or even bigger project will eventually present itself to me. I think everyone should have projects and plans for projects. Doesn’t matter what as long as it floats your little boat. And that wraps it all up. Hope you had as much fun as I did. Daily hike table compiled by Joe Bogardus Cpoy-pasted from Word so formatting a bit wonky. Day, date, elevation in feet , distance in miles. Author NeilPosted on March 4, 2014 March 4, 2014 5 Comments on It doesn’t get any better. My friend, inspiration and shrewd strategist, Cory Delavallé indicated to me a few weeks ago while we were hiking Saddleback Mountain toether that it would take roughly 10 days before my body was fully recovered. Today is day 2 and now that I have actually done this project what it means and what the impact in my life will be is beginning to sink in. Cory, who is an ADK giant, knew exactly what I needed when he and Albee broke out the north side of Seward for me. Every step of the way down that deep unconsolidated furrow that they created I was thanking them and my lucky stars that I had such friends. Years ago, another friend mentioned that when the elderly were interviewed about what they regretted not doing in their lives they never mentioned anything work-related. They regretted not taking certain trips or doing certain projects. I love my work but I love doing special projects either alone or with my wife Sylvie and my boys a lot more. Aside from the planning and training, about which I will write soon, I learned a valuable lesson regarding humankind’s social nature. We are indeed hard-wired to be socially involved. One would never expect to find someone indigenous living all alone in the Amazon jungle or African plains. People, even pre-“contact” Innuit were socially inter-connected. I conceived this project, put it together and executed it as part of a community. My closer hiking colleagues and friends, who include the Foundation executive board, has been in on this event right from my first glimmers of an idea. Jack Coleman and Geoffrey Day were selfless and avid team-mates, running the behind-the-scenes technical aspects and they answered all of my frequent questions about setting up this blog, on-line fund raising, downloading Spot tracks onto Google maps and so on. Kevin “Mudrat” Mackenzie pulled every string he could to get the message out into the Adirondack print and on-line media and is still working as I write these lines. Joe Bogardus, who has accumulated a vast archive ( a treasure trove) of personal hiking experience and data regarding elevation gains, distances and times for hiking the 46 High Peaks selflessly shared his data and we exchanged many e-mails throughout the planning phase. He also joined me for 4 days and 17 peaks. Incidentally, Joe, at age 65, completed his fifth consecutive single season winter 46 on Grace Peak during one of Project 46’s hikes. 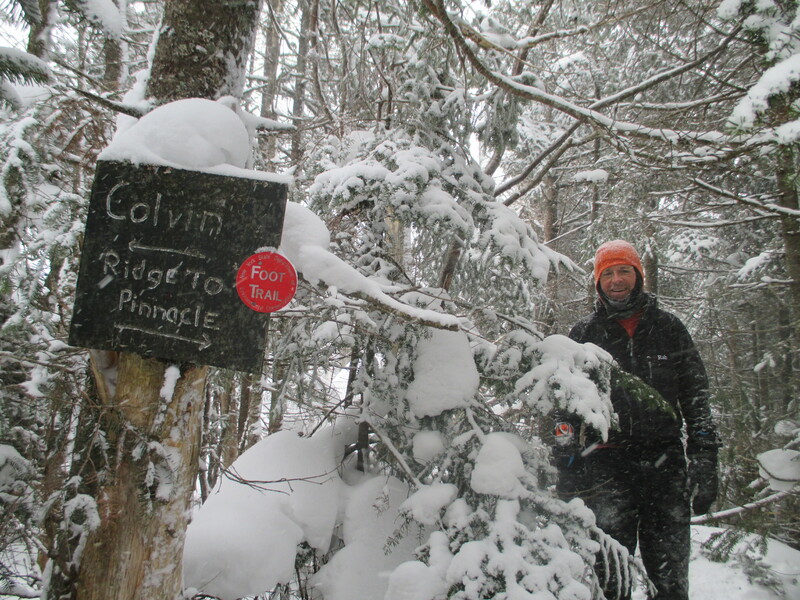 He’s a youngster on snowshoes with the hiking savvy of a wise man. Glen Bladholm (hope I spelled it right Glen!) is probably the hiking partner with whom I have logged the most miles and smiles, chuckles, laughs and difficult personal life events. 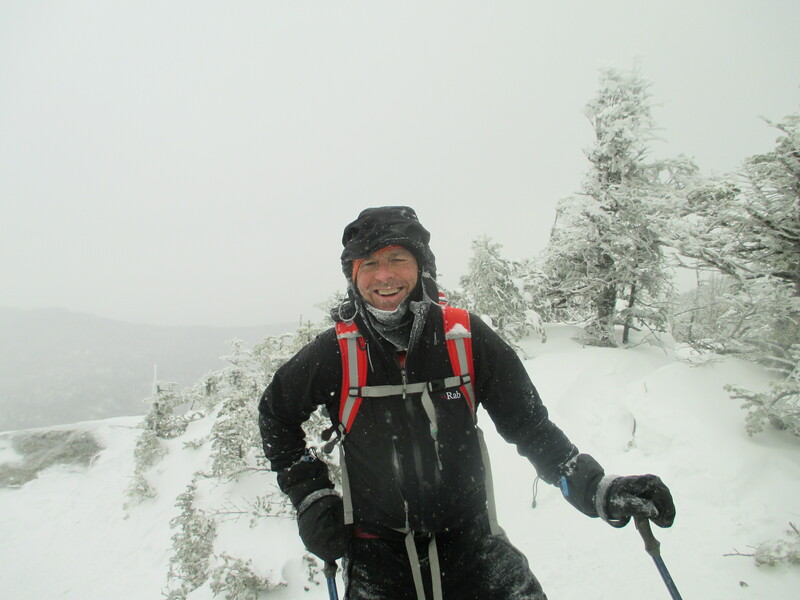 He and Geoffrey Day (Kyler on the forum) did 3 consecutive days including a huge day in wicked weather (Day 4 on Giant-Rocky and Whiteface-Esther). Glen has the best unintentional comic relief line of the Project, “you know things are bad when you turn the wipers on high as you approach the trailhead”. Taras “Trail Boss” Dejneka played a huge role in the months leading up to Project 46. He and I car-pooled from Montreal and we did a lot of really tough hikes together, mentally and physically tough. He was always game and when the going got tough was always right there, solid. More than once he drove my vehicle while I slept, having gotten out of bed at 3:30 am after a full day’s work, hiked 12 hours, finishing well after dark and driving home to get up and do another full day’s work. Taras was with me on Day 6 when we hiked the five Dixes with Joe and Justine Mosher (veggielasagna on the forum). David Gomlack stepped up to the plate big time for my most demanding hike of the ten. Close to 9000 feet of elevation and almost 50 kilometers (sounds more impressive than 30 miles) of hiking in cold weather on exposed summits in big wind. David is a fountain of good cheer and is a bottomless pit of humerous commentary and quick repartée and he never runs out of material. The miles melted away under his endless stream of banter and chatter. Thank you David for being there, so solid under your pranksteristic and light demeanor. Thank you also for going in and breaking out Seymour the day before I did it. Al (Albee) Bernier, who is a rare completer of the 777 list (777 3,000 foot peaks in the NE USA), became a close friend almost instantly we have so much in common, and he ended up joining me on 3 hikes and 11 peaks (correct me if I’m wrong, I’m not checking the numbers). He showed up near dark at the Cascade trail head for our first hike together with a nalgene bottle full of hot tea. Another one of those little gestures that speaks volumes. Rik, Inge and friends broke out the Dixes for me and Inge joined me, sort of, on Allen. After chatting with her near the bottom of the Allen “slide” my step was a lot lighter. Inge’s bubbly personality and incredible hiking force do that to one. Boghollow, another great hiking power house and friend, accompanied me through the 4 Sewards and fed me pastrami, Mountain Dew and home-made beef jerky. As we were early into the very long hike out from the base of Seymour to the gate I said to him, “you better go first or we’re never going to get out of here”. Back at his truck at 9pm after 14 hours of hiking he handed me chocolate milk, his own home-made oatmeal cookies and a bag of jerky. These things take on huge meaning at times like that. Alistair Fraser and I go way, way back to our early ADKhiking days and he came up for some big training hikes and was there, fittingly, on Day 10 for the finish. Tom Haskins and Doreen Heer should get a whole blog post just for them. I’m still at a loss for what to say but over the next week will figure out how to put into words my feelings of gratitude for their faith in me, their love and total friendship. For now just a humble thank you will have to suffice. Bruno from Fousderando, the French-language hiking forum, and Claude Cartier and Diane Lafrenaye, my brother and sister in-law did a bang-up job of taking my blog in English and creating a very professional french translation. Alex, the creator and keeper of Fousderando even created a special section on the forum just for the Project. The members of ADKHighpeaks and Fousderando were a source of inspiration when, each evening with my supper prior to planning the next day, I relaxed and chuckled while reading the forums’ posts. Finally, none of this would have ever happened without Sylvie, my friend, my life companion, and my lover with whom I look forward to the best third of our lives. Lives which will be spent together in a quest of meaningful and life-enriching experiences (like spending 2 weeks in a pup tent near a mosquitoe swamp studying nature just for fun). Sylvie was with me every step of the way from the conception to the end. My next project is going to be helping her conceive and execute her project, whatever it shall be. It’s her turn now. But before that she and I will be going to the French Alps to do some……hiking! Her favorite: hiking and culture, which in french sounds better: “nature et culture”. Author NeilPosted on March 1, 2014 March 1, 2014 11 Comments on Over my shoulder.